Here's an idea for a quick and yummy Spring/Easter dessert. It comes from the creative mind of my dear friend, Tracey Conway. 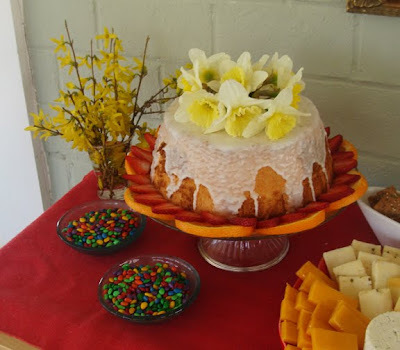 She began with a plain 'ole store bought angel food cake. Then Tracey whipped up a delicious glaze using freshly squeezed lemon juice and confectionery sugar and drizzled it over the cake. She sliced navel oranges and strawberries to garnish the perimeter. And for the final touch, Tracey inserted a small water glass in the center and filled it with freshly cut daffodils from the yard. So charming, easy AND delicious.